A photon is a discrete packet of energy associated with electromagnetic radiation (light). In this case the photon length is from 450 nano metres to 640 nano metres which puts it in the visible spectrum and at the safe end of it. For instance, from 695-1200nm permanent, safe and painless hair removal is achieved. Ultraviolet and ultrared are both outside the 450-640nm range. Red + Blue (Purple,) Has the effect of draining the lymphatic system, thus reducing wrinkles. Seven light combinations - each affecting the skin's cells differently because of the effect of each different wave length from 450 to 640nm. Photon energy irradiation uses the ability of the body's cell structures, called the chromophores, to react to light. This bio light stimulation causes specific chemical reactions inside the cells which rearrange and renew themselves. Phototherapy/colour therapy treatment also works as a natural sun block if used on a regular basis. Ultrasound is effectively used for any part of our face or body. 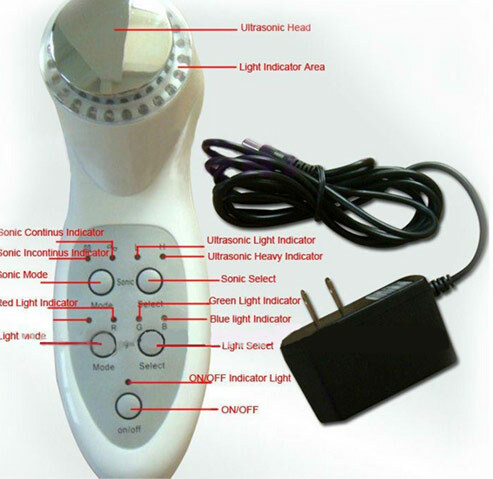 Ultrasound body massager emits high frequency waves, invisible to the eye and mostly undetectable by our sense of touch, meaning you can't feel them. Ultrasound massage is also known as "micro-massage". The depth of the wave penetration depends on the ultrasonic frequencies - the higher the frequency of the vibration the more shallow the wave penetration. And vice versa, the smaller the number of wave vibrations the deeper it penetrates under the skin. Therefore the 1MHz mode (1 million times vibrations per second) is a better option for body treatments (tissues and muscles are thicker). The 3MHz (3 million times vibrations per second) mode is optimal for facial treatment (tissues and muscles are much thinner). The vibration produces fast repeated stretching and shrinking of the cell membranes which improves skin elasticity, stimulates skin metabolism, promotes collagen production. Vibration of this kind generates soft cellular tissue massage, which has a powerful stimulating effect. At the same time the head of the device produces mechanical massage without stretching the skin, unlike regular facial massage. Ultrasound massage of 1 MHz provides deep cellular massage and increased skin absorption abilities. You can use the photon and ultrasound functions together or separately. The Photon Ultrasound machine will automatically switch off after 20 minutes. If more photon ultrasound therapy is to be used the same session then the next and last 20 minutes should use a different colour which includes the calming and cleansing effect of blue or green. Certifications / License: CE	email Carla if you have a special request.